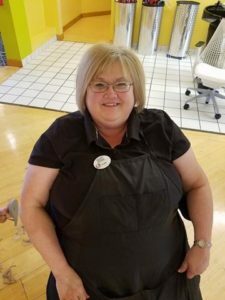 This Mentor Spotlight is all about Ms. Joan, a Coach and Dream Maker at the Academy of Beauty Professionals – Green Bay! We asked Joan a few questions about her experiences in the Beauty industry. Here’s what she said! Q: How long have you worked for the Academy of Beauty Professionals? Joan: I started March 13th, 2016 – best career choice I ever made. Q: Where did you get your Beauty Education? Joan: Martin’s College of Cosmetology in Manitowoc for all of my licenses. Q: How did you get interested in Beauty? Joan: For some strange reason I always cut all the hair off every doll I had. My mom said it was my natural path to follow. Q: What is the best part of your job as an ABP Mentor/Coach? Joan: Seeing how a person grows from the beginning of school to graduation, then going out into the field and achieving their dreams. Q: What is your favorite service to perform, and why? Joan: Clipper cut – the click when you turn it on sends chills down my spine. I love seeing a good taper cut. Joan: Anything that is silly and makes me laugh! Q: If you could have dinner with anyone in the world, dead or alive, who would it be and why? Joan: I would have dinner with my dad. He passed away 18 years ago. Q: Tell us something else we don’t know about you! Stay tuned for more Mentor Spotlights! Posted in Beauty School, Mentor Spotlights.